As the evenings draw in, and longer, warmer kit and lights are putting in appearances it is time to review the VC Melyd Winter Riding Schedule. Through the summer we had seen a move to Wednesday evening social rides. These allowed those who wanted to compete in the TT events and also get in a social ride during the week the evening afterwards – and vice versa. TUESDAY NIGHT RIDE – 1830hrs Saints Gym, Meliden – social ride. WEDNESDAY NIGHT RIDE – 1830hrs Waen Gate*, Waen – higher tempo for a loop of the vale. Do check in with Facebook for specifics on a week by week basis… turnout obviously dependant on YOU and others just like you. Don’t be a fair weather rider! Monday night – Ladies Track Session (no lights), Marsh Tracks, Rhyl. Tuesday night – Social Ride (lights), 1830hrs, Saints Gym, Meliden. Wednesday night – Higher Tempo Ride (lights), 1830hrs, Waen Gate. Thursdsay night – Junior track session, 1800-1900hrs, Marsh Tracks, Rhyl. Be considerate out there people – if you are not running mudguards yet, it may be time to start thinking about it! Note: * ‘Waen Gate‘ is the car park next to the roundabout/sliproad that provides exit/access to the Eastboundound. This week’s route takes us down the Vale of Clwyd once again. The route is 54.9 miles in length, and climbs 3,121ft – and can be found on Strava. This route takes in four loops, and starts at Saints Gym Meliden, before picking up at Rhuddlan, and heading back on itself out towards the Waen, through Trefnant, top road to Denbigh, the steep way to Henllan, with the highest point being at Groes, before dropping back down to Denbigh. 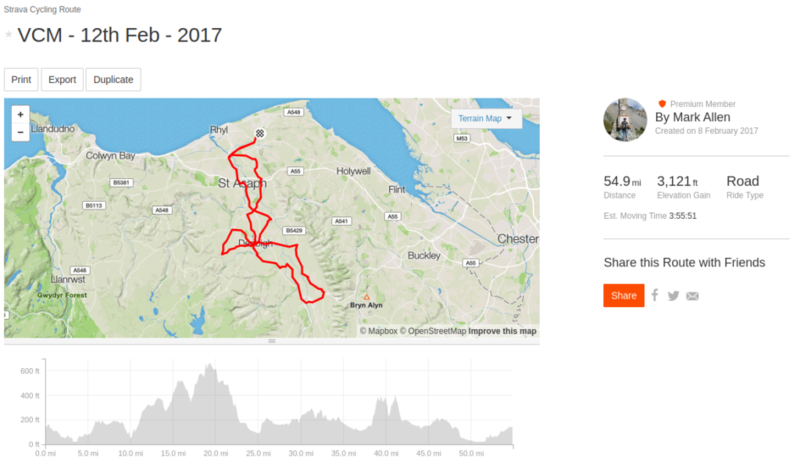 The Five course to Llandyrnog, along to Llanfair DC, before Ruthin, Rhewl for the back way through Llanynys, and off to Llanrhaeadr before dropping back down to Denbigh again before home via the main road to St Asaph and bypass home. Thank you to Vic for organising this weeks social ride. 57.7 miles, and 3,786ft of climbing – although flatter routes back are possible options depending on group size and ability. Cafe stop at Ness Gardens – suggested route attached.